A guide to building and using your own "homebrew" fly tying tools and accessories. Here's something different in the way of books for fly tyers ... a book that does not include a single fly pattern! That's right. FLY TYING TOOLS YOU CAN BUILD does not include a single fly recipe. Instead, it's loaded with plans and projects for making your own fly tying tools! From bobbins and whip finishers to desktop tying stations, dubbing brush makers, and even homebrew fly tying vises, this book brings a whole new dimension to the fly tying experience. With 240 pages of great tying tool projects, FLY TYING TOOLS YOU CAN BUILD was written with the hobbyist in mind. You won't need specialized skills or exotic tools to complete these projects. Numerous detailed illustrations help make these projects easy to build, and every time you finish one you'll have a new and genuinely useful tool or accessory to add to your fly tying bench! Like other hands-on books from Chattahoochee Media, FLY TYING TOOLS YOU CAN BUILD is a book that's designed to be used. It features durable lay-flat and workbench-friendly coil binding, making it even easier to put this exciting new title to work. 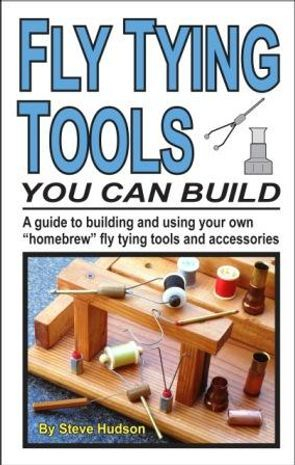 There's literally no other book like FLY TYING TOOLS YOU CAN BUILD. This is one book that every fly tyer will definitely want to have ... and for a limited time, we're celebrating the publication of this great new title with a special web store introductory price of just $19.95. That saves you $5 off the cover price! Order your copy today, and begin enjoying the fun of building and using your own fly tying tools! Bobbins...bobbin threaders...half-hitch tools...magnetic fly easels...dubbing loop twisters...bead management accessories...tool organizers...hair stackers...hackle pliers...dubbing brush makers...desktop tying stations...fly photography systems...fly turners...leg pullers...and even a special chapter on homebrew fly tying vises! Your ultimate guide to learning the fine art of tying flies. By Steve Hudson. 288 pages. $27.95. A Structured Course in Fly Tying is designed to teach you the practical aspects of fly tying, one at a time, on your schedule. Master teacher Steve Hudson has combined years of experience in education with a passion for teaching others the joys of fly tying to develop this uniquely structured and technique-based fly tying course. This fly tying book is perfect for beginning tyers who want to learn the fly tying art! No prior tying experience is necessary, and you can work thourgh this course at your own pace. Everything unfolds in almost 300 pages of clear, concise and extensively illustrated instruction, with every lesson building on the ones that came before. As you use A Structured Course in Fly Tying, you'll be going through a carefully structured series of lessons designed to help you learn the key elements and techniques of fly tying - one at a time. Along the way you'll tie dozens of proven and effective flies that you'll be able to use on the water right away too! It's all presented in a structured sequence designed to help you learn, and all of the tying instruction is greatly enhanced by numerous original illustrations created especially for this book. "Over the years, after teaching hundreds of students to tie flies, I have learned what helps beginning tyers learn as smoothly and as enjoyably as possible," notes author Steve Hudson. "Those insights are the basis for this book. It makes learning to tie flies fun!" 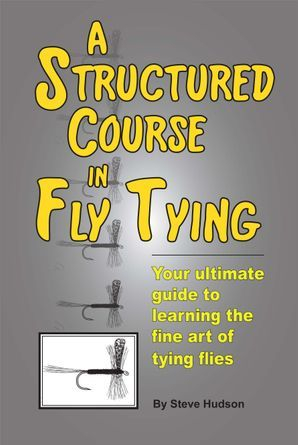 "This may be the ultimate in self-paced fly tying instruction. Steve Hudson helps you build your skills one step at a time. It's almost like having him sitting there beside you every step of the way." "If you want to learn to ties, you need this book. It works!" How to tie and fish ten essential flies for bream. By Steve Hudson. 112 pages. $18.95. Do you enjoy fly fishing for bream, bluegill, and similar species in warmwater lakes and streams? Then Bream Bugs: How to Tie and Fish Ten Essential Flies For Bream will make your tying and fishing even more enjoyable than ever before! Filled with step-by-step instruction on how to tie and fish a fly box full of proven patterns, this exceptionally useful guide gives you clear and detailed instructions covering every step of tying every fly. 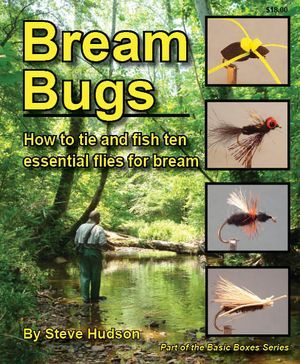 It also includes practical tips on how to fish these flies on creeks, streams, lakes and pond, and it offers unique insights that will help you design, create and customize even more great bream patterns of your own. "This book covers proven classic bream patterns and techniques and has great new and fresh material as well. It will help any fly angler get serious about targeting bream." "A basic and simple approach to tying flies that work...the detailed instructions and illustrations are invaluable to any tyer. Steve has a unique and uncomplicated way of presenting ideas about fly tying. He makes it fun...exactly what it should be!" A practical guide to designing and tying flies for trout in stocked streams and delayed harvest waters. Can you design and tie flies especially for stocked trout and delayed harvest trout fishing? Yes, you can...and Tying Flies for Stocked Trout shows you how. Taking a behavioral approach to understanding what makes stocked trout tick, this exceptionally useful book features step-by-step instructions on how to tie dozens of flies designed especially for stocked trout. You'll learn not only why each fly is designed and tied the way it is but also how you can put these flies to work on the water. You'll also gain an understanding of what you need to know to design, create and customize even more patterns of your own design. "A fantastic reference book. You'll feel that Steve is right there with you offering his guidance at each step along the way." "A great starting point for beginners or a refresher for experienced anglers. The techniques, tying methods and flies are relevant and extremely effective. These patterns as well as the techniques should be in any angler's fishing arsenal." 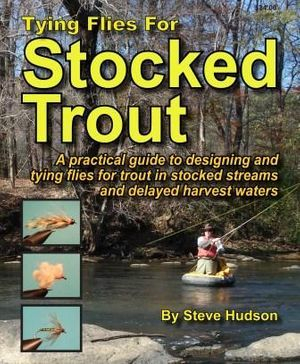 "Steve Hudson has done a comprehensive job of putting together a simple, no-nonsense guide to tying flies that work." Jimmy Jacobs, author of "Trout Fishing in North Georgia"